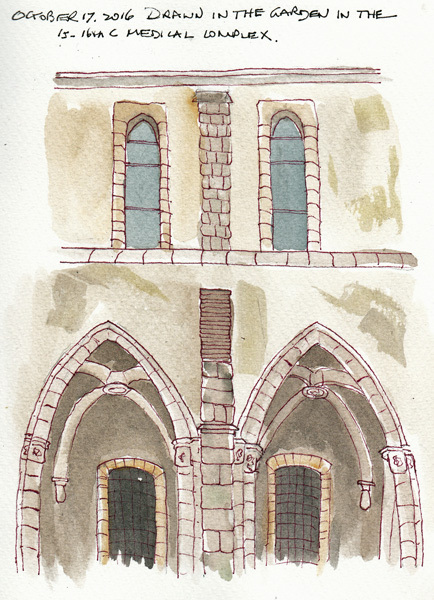 I came home from Barcelona with a sketchbook full of ink drawings, but only half of them were painted. There weren't enough hours in the day! But I did have phone photos to use for my watercolor washes. 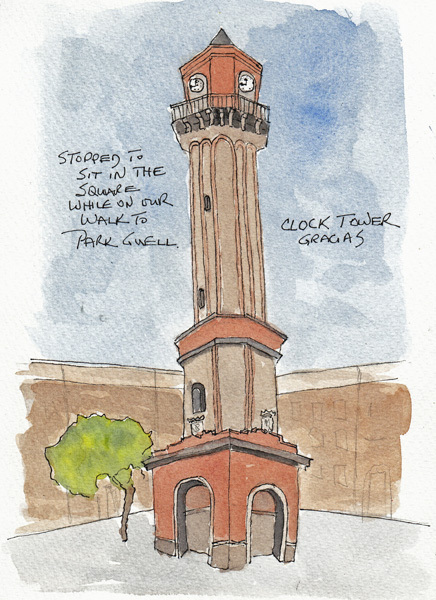 This is the Gracias Clock Tower - which sits in a lovely village square in Gracias, within walking distance of our hotel. There were children playing and adults sitting on benches, but we were on a much longer walk so we sat for only a few minutes to enjoy the ambience. 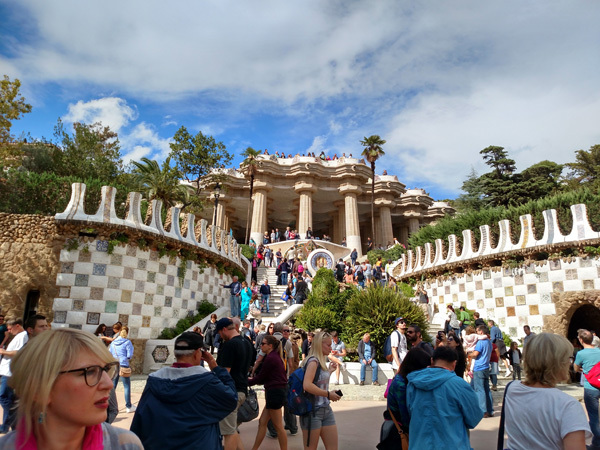 Our hotel staff didn't recommend that we walk to Gaudi's Park Guell, but we reminded them that we are New Yorkers and my husband takes 4-5 mile walks around Central Park several times each week. But we had an online reservation for entry so we couldn't stop for more than a few minutes along the way. This is the view of the Park from halfway up the hill. The little heads you see above the columns are sitting on the serpentine bench that are a created from gorgeous broken ceramic tiles (trencadis). The back of the bench - photo just because I loved the colors and design! We sat on a bench in the shade while I sketched the top of one of the two gingerbread houses at the main entrance of the park. This is a huge art exhibit month in New York City. In addition to the Fall Museum Exhibits, there are terrific gallery shows, and the huge auction previews. Both Sotheby's and Christies now have combined auction previews for Impressionist /Modern and Post-War/Contemporary that last in each auction house for more than a week. 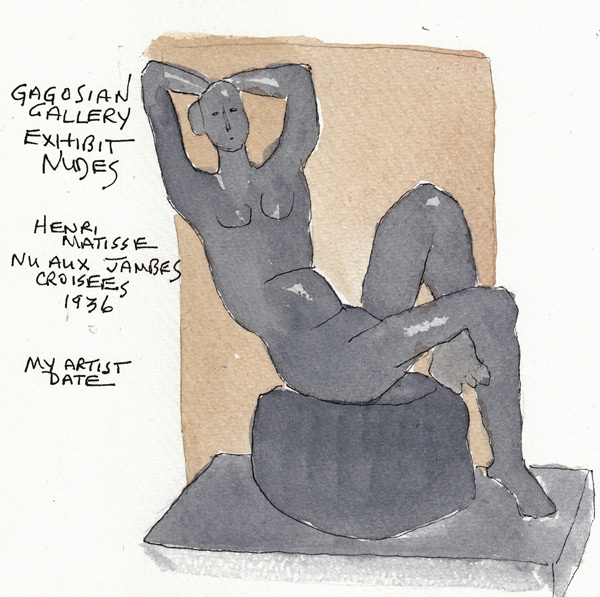 During my visit to Gagosian Gallery's exhibit "Nudes" and both Auction Gallery Previews I sketched pieces of sculpture that I liked and photographed many paintings that inspired me. Matisse Sculpture at Gagosian Gallery on Madison Avenue: The balance achieved in this life-size sculpture was fascinating. 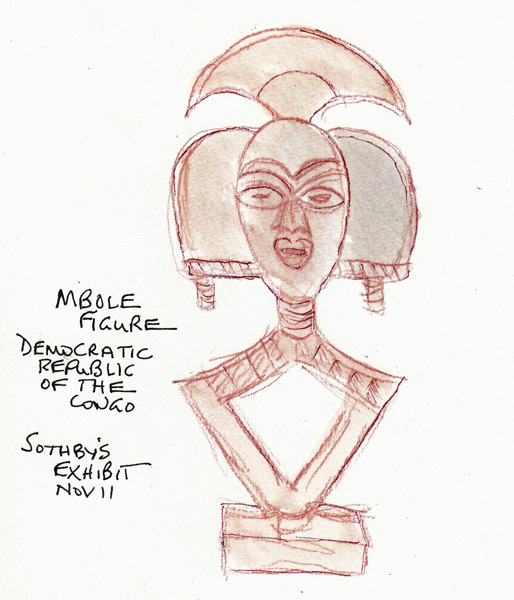 Maillot and Degas Sculptures at Sotheby's: These life-size sculptures were next to each other making it fun to place the drawings together. 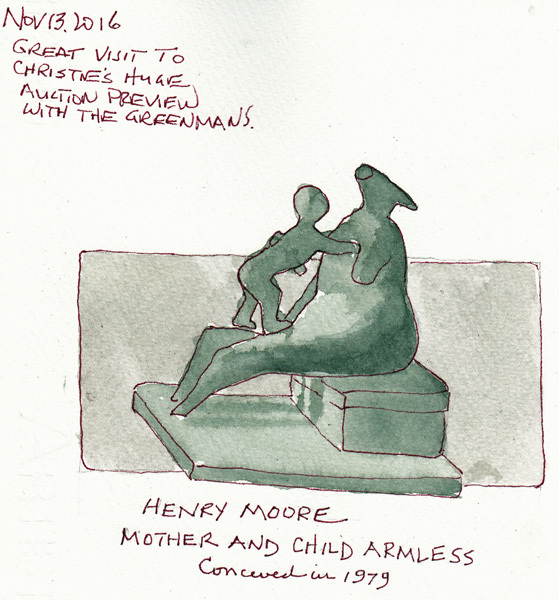 Moore Sculpture from Christies: I love the family series of sculptures done by Moore and this one was very small and just right for my sketchbook drawing of the day. 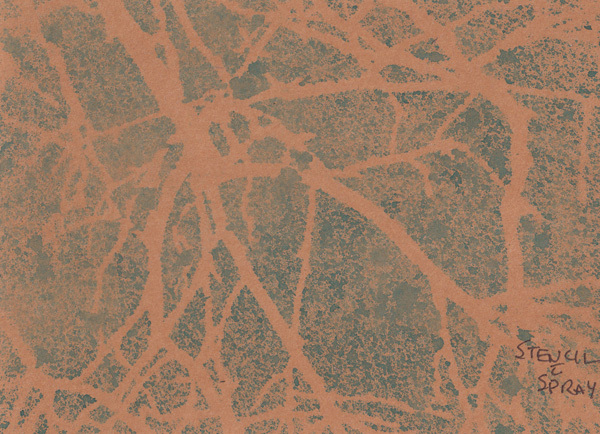 Kraft-Tex is a combination paper/fabric product and like Ultrasuede, it doesn't ravel. I took a half-day class with Australian Quilt Artist Cecile Whatman and had an opportunity to try it with many media. 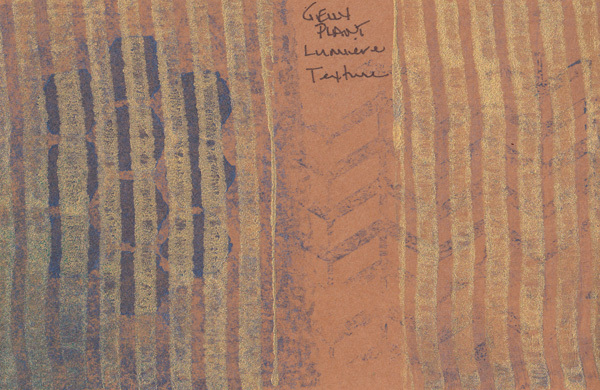 Cecile brought a book she made, using Kaft-Tex as the cover. It is a sturdy product and she said the book cover was simple to make decorate, and machine sew. 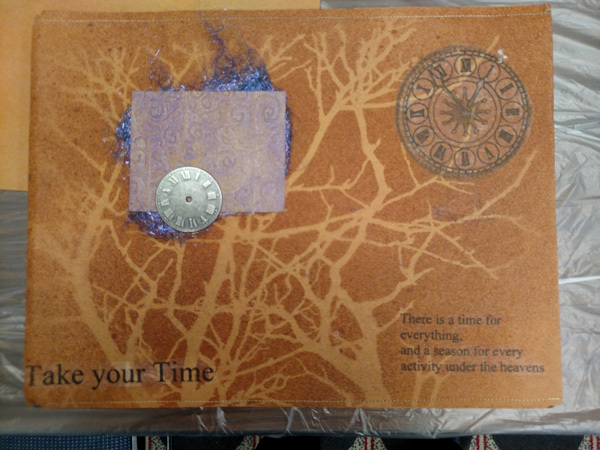 It is currently available in natural, white, black, gray, and brown and is distributed by C & T.
She used a tree stencil and dilate acrylic spray for the overall design. The purple/blue square is painted and embossed Kraft-Tex, and the black images and text were transferred with TAP (see previous blog post). When Kraft-Tex is washed it becomes more like a leather, and it is softer and can be used more like fabric. This is a piece that I washed by hand and dried twice and you can see the difference in the texture. Cecile once washed a piece with 20 of her regular washes. I spent our "playtime" trying many media on sample size pieces of Kraft Tex. 1. Blue acrylic stencil images, then gold Lumiere Acrylic painted over a Gelli plate and combed before printing. 2. 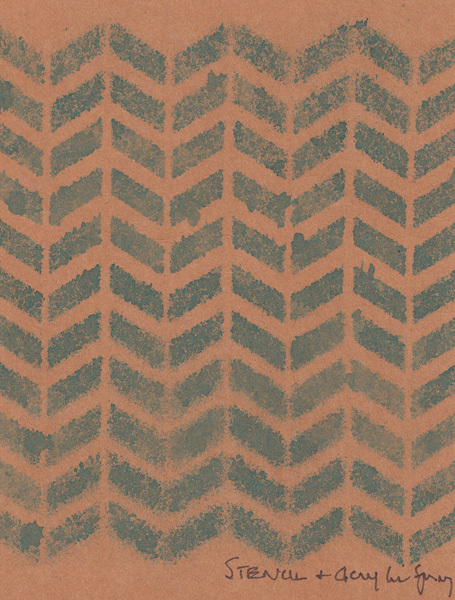 Stencils sprayed with dilute acrylic paint (2). 3. 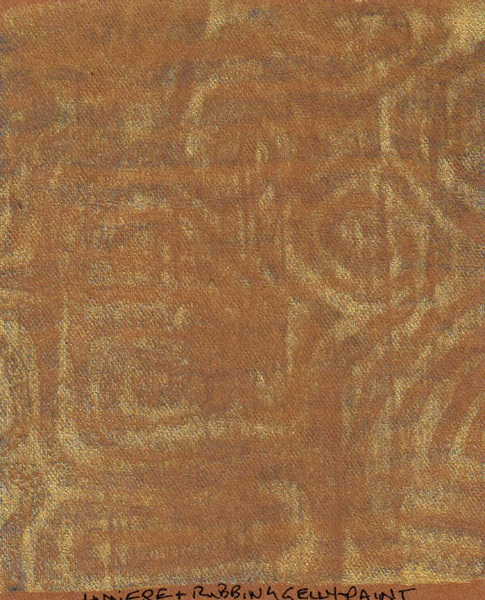 Gold Lumiere acrylic paint on a Gelli plate - then lifted with a rubbing plate before printing. 4. 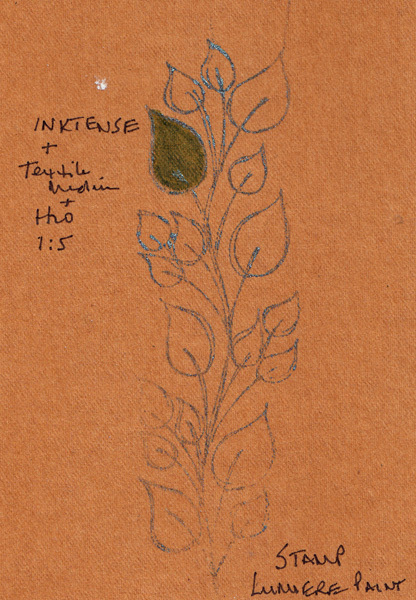 Stamped, then Inktense pencils - leaf painted with water mixed with textile or matte medium diluted 1:5 to make the color permanent. 5. Center image made with Shiva oil paintstick. Then the piece was foiled using the following adhesives: Adhesive thread, Misty Fuse pulled apart slightly, and Bonash adhesive granules. 6. 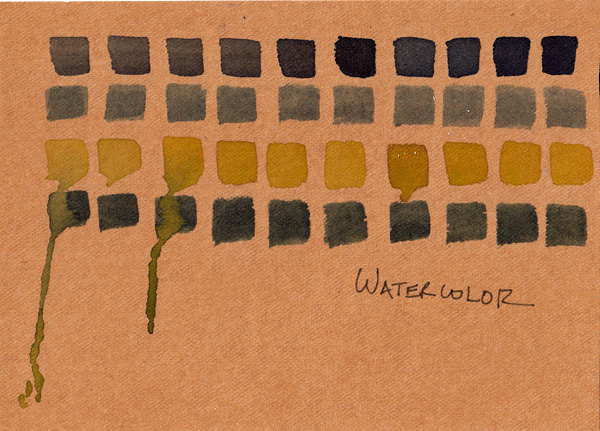 My watercolor paints - painted on and then dripped. The Kraft-Tex comes in rolls that are 1.5 yds long and 18" wide. Last Week I was at the International Quilt Festival in Houston - an annual trek I began in 1983. It was so small then that it was held in the now destroyed Shamrock Hilton Hotel. I watched it grow until now it takes up 3 floors of the HUGE George Brown Convention Center. Tuesday I was preoccupied by the election and yesterday I was in shock and unable to think clearly. So my first blog post of the week is several days overdue. I took a 3 hour workshop on the use of TAP and wanted to share what I learned. Here is my testing of the transfer of images and brushstrokes from TAP to watercolor paper. 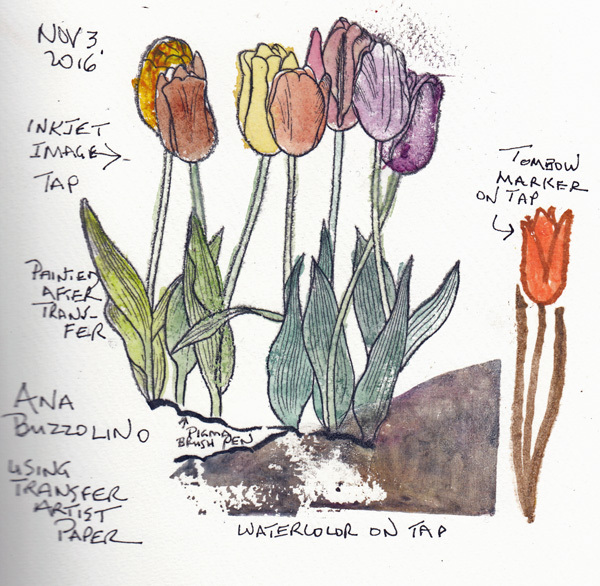 The tulips were a transfer of black and white Clip Art that was printed onto TAP with an ink jet printer and then transferred to my sketchbook. Since the image is a polymer, I painted it with watercolors to see if the image could be painted. It could, I then painted a snippet of the TAP with watercolor and transferred it to the page as dirt under the flower stems. We were told that you can draw-paint-color on the TAP as long as you don't scratch the surface. The wide black line was a Pigma brush pen line I transferred from a snippet of TAP, and the single tulip on the right was an image drawn on another snippet of TAP with Tombow brush markers and transferred. I then transferred clip art images to fabric. The yellow rectangle is velvet, the upper green rectangle is cotton, and the bottom triangle is silk. They were all fused to a white fabric square with Wonder Under before transferring the images to the fabric square. Each of the fabrics accepted the images well. 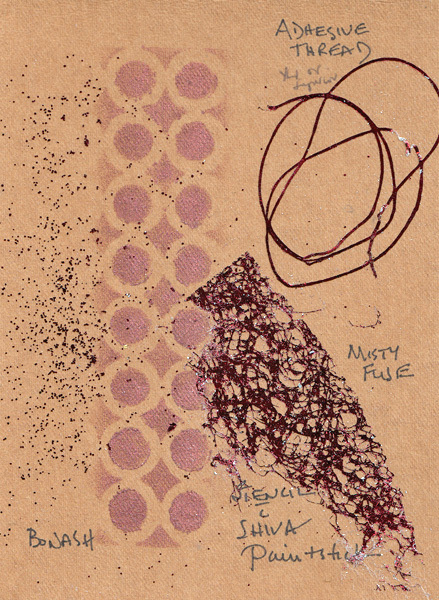 The "dot doodles" were made with Tombow marker directly on the Tap and then transferred. Images are printed on the polymer side of the TAP with an ink-jet printer or created right on the TAP, and then placed face down on the fabric or paper. They are then covered with Parchment paper and ironed for 10 seconds with a hot dry iron. The images are permanent - and so is the color - so there are many uses for this technique - and it is lots of fun to play with it! 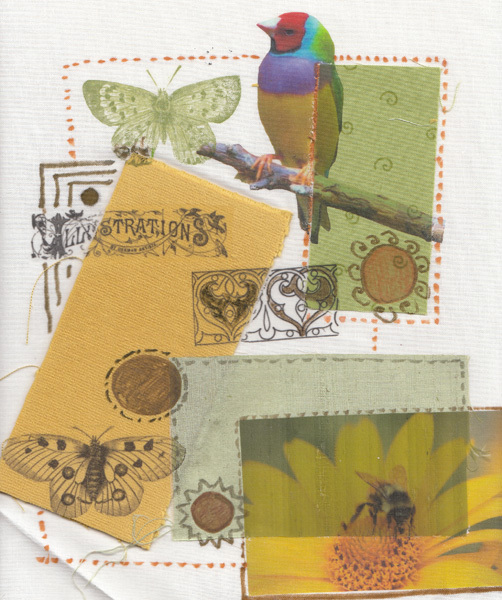 Next: Using Kraft-Tex, a combination fabric-paper with any mixed media technique. 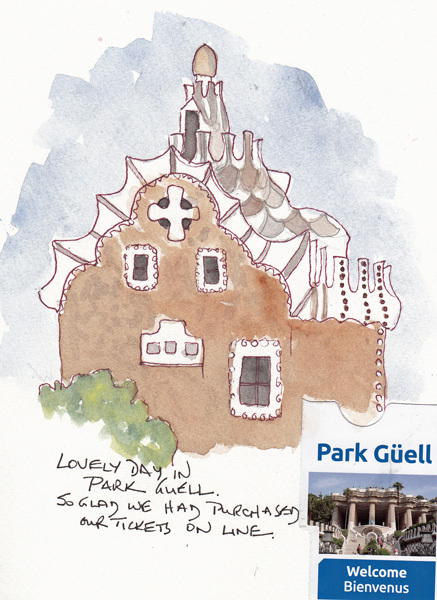 I am currently in Houston, but wanted to continue to post my Barcelona sketchbook pages. Today Part 3. 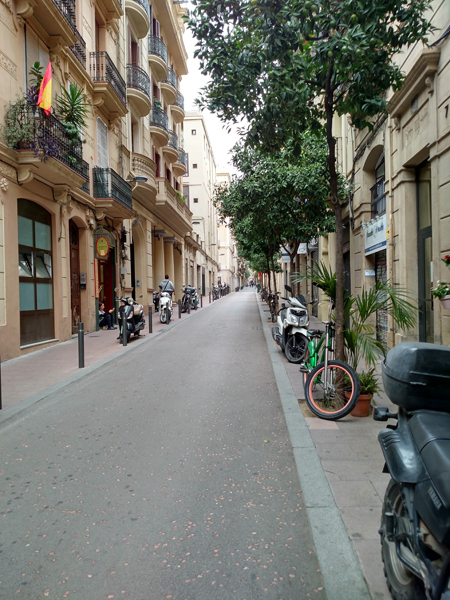 Gracia was just north of our hotel and we walked for hours exploring the tiny streets. 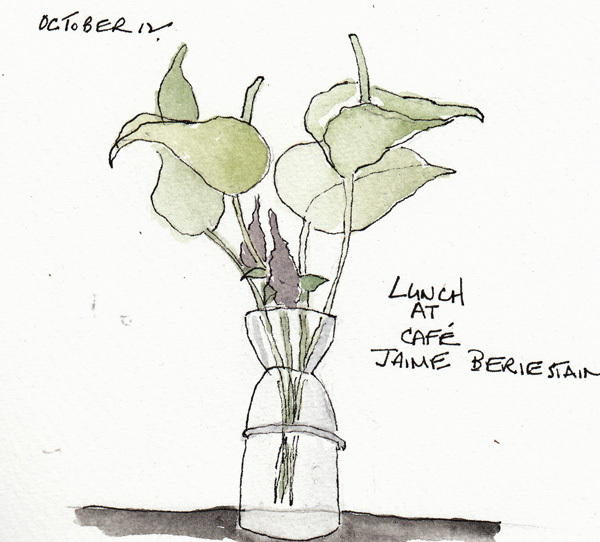 After miles of walking, we returned to our neighborhood and had lunch at Café Jaime Beriestain. We loved the restaurant and returned later in the week for an equally good dinner. This plant was right across from me as I ate. 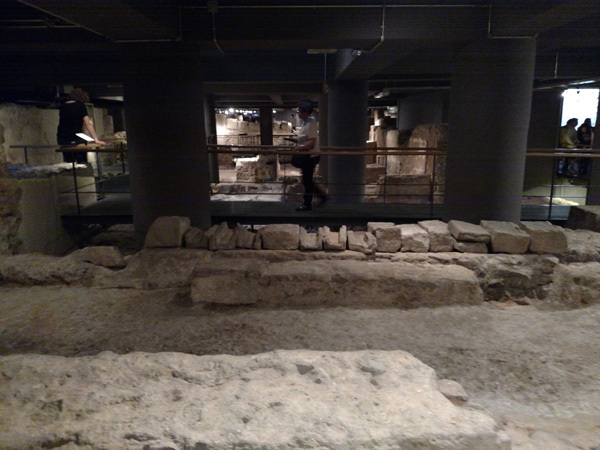 Roman ruins under the Barri Gotic Cathedral are 4000sq meters for a population of 1000 . 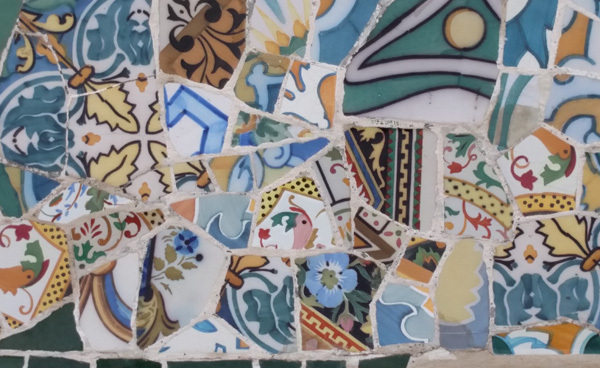 There is an excellent audioguide to this fascinating glimpse of ancient Barcelona. There are walkways suspended over individual sections of the ruins, which can be seen in my photo below. The winery was extensive and wine was their largest export. 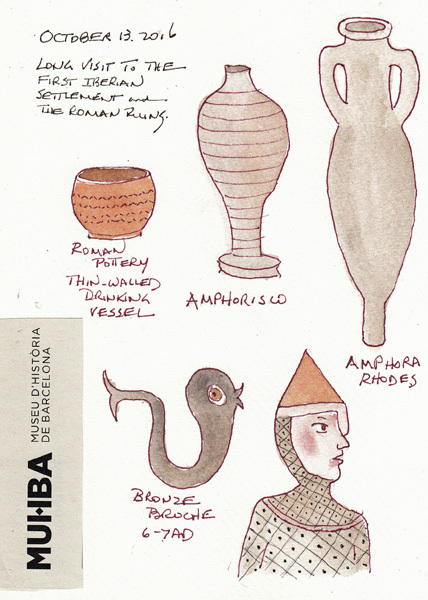 I sketched the objects we saw in the museum - some of my favorite shapes. I reread Zafon's book The Shadow of the Wind while in Barcelona. One evening I read that the main characters were meeting in the Cloister of the University, and on our long walk to the Ancient Medical Complex, we went into the main building of the University of Barcelona (started in 1450) and sat in the Cloisters. It is beautiful! We then walked through several of the buildings from the Ancient Medical Complex (15th-16th C), although the anatomy amphitheater was closed. We sat in the Garden between the buildings and before leaving went into the Biblioteca Barcelona which was created in these buildings. I sketched only two arches from the colonnade which surrounded me in the Garden.